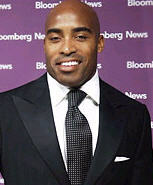 NEW YORK (AP) -- Former NFL running back and new "Today" show correspondent Tiki Barber said his offseason work at Fox News Channel made him recognize he had a passion for a career outside of sports. Barber also said his problems with New York Giants head coach Tom Coughlin had "started to take its toll on me." The just-retired NFL running back was formally introduced as an NBC Universal employee on February 13. He'll contribute news and human interest stories to "Today," and he'll be an analyst on NBC's Sunday highlight show "Football Night in America" in the fall. He spurned offers from Fox and ABC/Disney to take the NBC job. "My dream has always been to be on the `Today' show," Barber said. Barber, 31, retired as a Pro Bowl running back, scoring a touchdown in the NFL all-star game last weekend. Barber and his disciplinarian coach had their rough patches, particularly when Barber said the Giants were outcoached after a playoff loss a season ago. Barber laid the groundwork for a broadcasting career while still active in the NFL. He was a correspondent for the Fox News Channel morning program "Fox & Friends," and has two programs on Sirius Satellite Radio, one on general topics and another on football that he does with his twin brother, Ronde Barber of the Tampa Bay Buccaneers. Few other novice broadcasters would get such a lavish introduction to their new business: a news conference attended by NBC Universal President and Chief Executive Jeff Zucker, the presidents of NBC News and Sports, and "Today" co-host Matt Lauer. Zucker compared Barber to Joe Garagiola, another "Today" personality with a sports background, and former Giants star and longtime broadcaster Frank Gifford. Barber "pops through the screen" and is incredibly popular with women, who make up the bulk of the "Today" show audience, Zucker said. "He's incredibly handsome, he's incredibly charming, he's incredibly personable and he's incredibly smart," he said, "and that's a rare quality." NBC News President Steve Capus also said Barber came with a backup. "On those days when you're not feeling well, we'll just call Tampa Bay and get your brother," Capus said. NBC is owned by the General Electric Co.